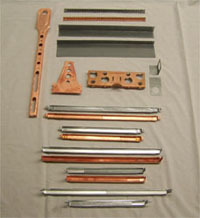 Many types of stub-out options available, ranging from traditional copper plated stub-out bars to galvanized brackets with plastic inserts. From the time-proven telescoping Basset Bracket to various pipe positioning brackets, plenty of choices available for both HVAC and plumbing installations. Metal riser and beam clamps for light to medium loads. 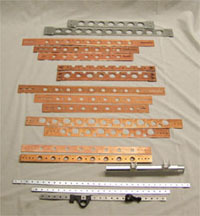 Plastic tube straps and clamps for copper, PVC and CPVC tubing. Copper plated tube clips support copper tubing at both the fixture stub-out and ‘through floor’ risers. 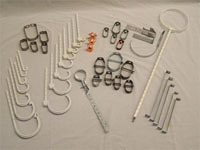 Variety of plastic and metal hangers for supporting PVC, CPVC, copper and steel pipe for plumbing applications. 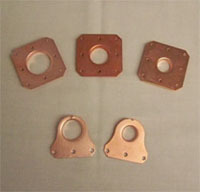 Metal hangers for supporting square and round duct work for HVAC installations. Pipe hooks available in plain steel, copper plated or plastic coated. Many sizes and wire gauges to choose from. 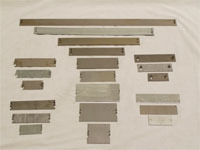 Plastic inserts for galvanized stub-out bar, metal studs or wood framing. 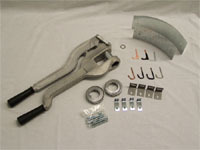 Various anchoring products for tubing, duct work and water heaters. Metal stud punch for cutting 1–11/32″ hole. 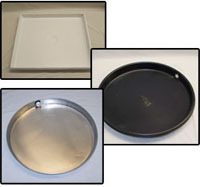 Aluminum or plastic water heater or washing machine pans. 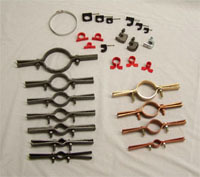 PEX tube clamping and positioning brackets. Building code required protective metal plates help ensure no nails or screws penetrate electrical, plumbing or HVAC system branch lines. Also used to reinforce structural framing when notched or drilled. 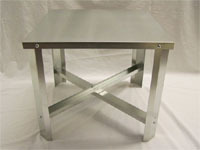 Standard and heavy duty metal water heater stands. 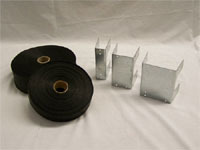 Metal and plastic straps for duct and pipe support. Metal protective guard prevents nail or screw penetration into electrical cable, plumbing tubes and pipes or gas supply lines. Flexible duct and wooden stud support.